Right Worshipful Master Brother Bill Johnston, of Lodge Livingstone St. Andrew No. 573, centre, presents £500 cheques to Sam Lavery of St. Andrew's Hospice, left; Lorna Galbraith. head teacher of Glencairn Primary School, front second left; Marion Reid, head of services at Ailsa Nursery Centre, second right; and Bill Brentnall, chairman of the Friends of Dalziel Centre, right. Also in the picture are Mr Johnston's wife Anna and Brother John Davidson, Right Worshipful Master of Lodge Motherwell Caledonian No. 1228. Photograph reproduced with the kind permission of June Adam, Motherwell. cheques totalling £2,000 to four local charities. The presentations took place at an open day in the Masonic Hall in Hope Street staged by Lodge Livingstone St Andrew No 573 to mark its 125th anniversary. "We were pleasantly surprised by the response from the public and the interest they showed on their visit to the Temple where we hold our meetings, and the time they were prepared to spend with us. With the support of two other lodges in the town we tried to open up to the public in an attempt to redress some of the criticisms, rumour and doubts associated with Freemasonry. Judging from the comments we received from the 100 or so people who visited I think we succeeded. 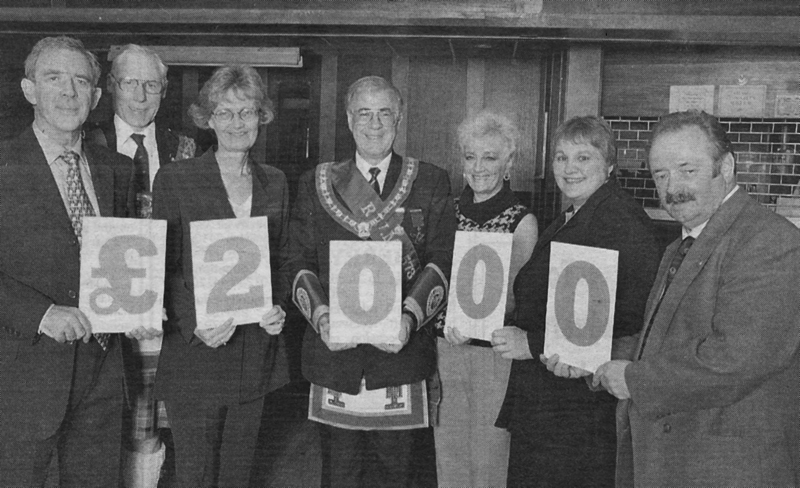 Charity has been the keynote of local masonic activities for more than a century and it seemed fitting to mark our 125th celebration by presenting four £500 cheques to charities." Ailsa Nursery Centre, which caters for 140 children in North Motherwell. plans to use the money to help buy special equipment for children with physical disabilities. Friends of the Dalziel Centre in Strathclyde Hospital intend to put the money to improve patient welfare and contribute towards providing visits to Christmas pantomimes. Glencairn Primary School will purchase computer software to support pupils who have hearing and language difficulties and St Andrews Hospice will use its donation to provide and extend palliative care for patients with terminal illness, both in the hospital and at home. Article reproduced with the kind permission of the Motherwell Times.